In 1994, if you were a monarch, billionaire, or even mere millionaire, and you wanted to buy the ultimate, ultimate, wristwatch, it would probably have been a Gerald Genta Grande Sonnerie. 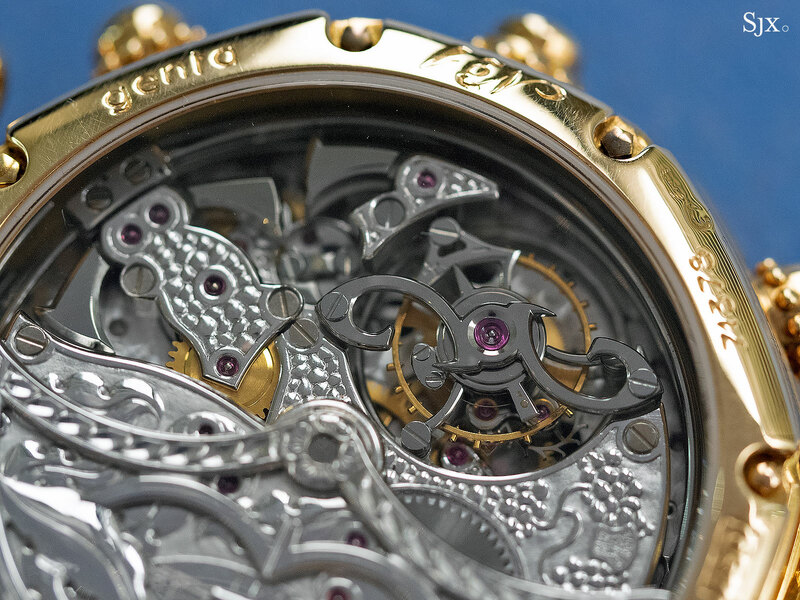 When it made its debut in 1994, reputedly conceived specifically for a royal client, the base model Grande Sonnerie was the most complicated watch in the world, with a movement made up of about 800 parts. It retailed for approximately US$900,000, which is about US$1.5m today, adjusted for inflation. Put simply, the Gerald Genta Grande Sonnerie was the Richard Mille RM 56-02 Tourbillon Sapphire of its day. Though the late Genta achieved stylistic stardom with the Royal Oak and Nautilus, the Grande Sonnerie put him in the record books in terms of complicated watchmaking. The base model was a mere grande et petite sonnerie with Westminster carillon striking on four gongs, plus a tourbillon and automatic winding. More complicated versions added a retrograde perpetual calendar to the mix, and even a second time zone, bringing the part count of the movement to well over 1000. 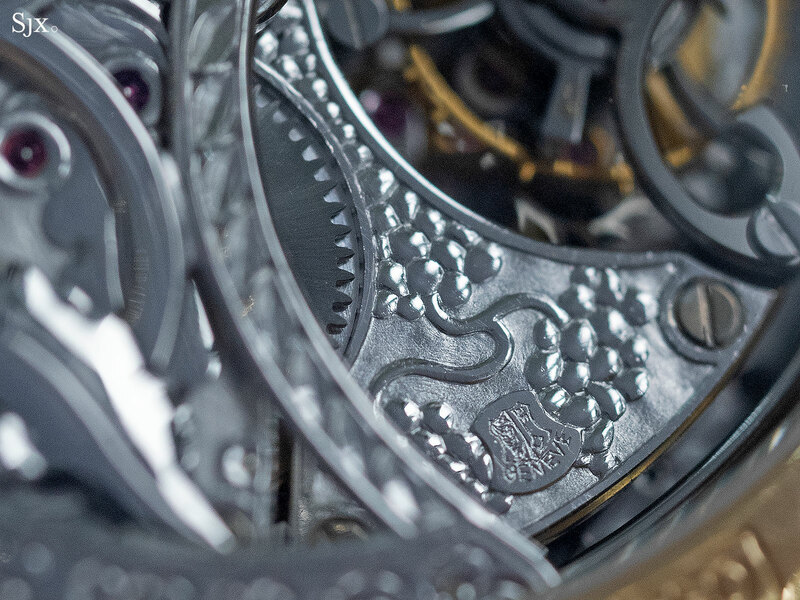 The movement was conceived by an all-star team of watchmakers led by Pierre-Michel Golay, who later went on to construct even more complicated movements for Franck Muller. 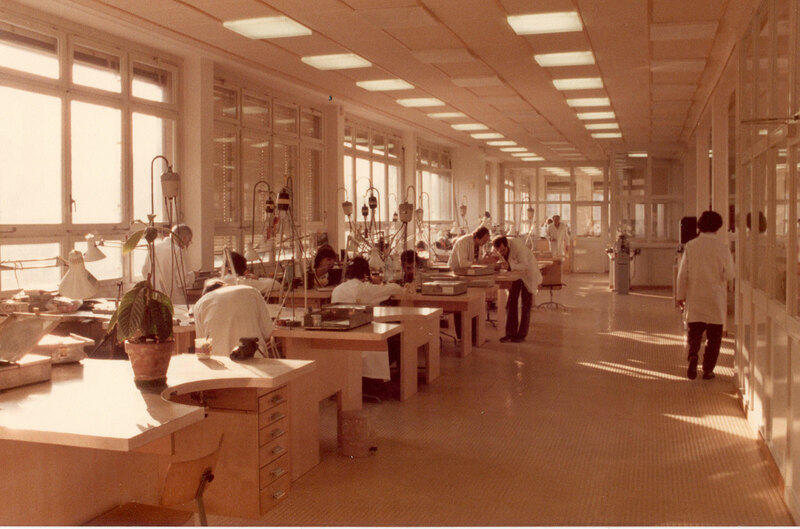 Other watchmakers who worked at Gerald Genta during the period including Demetrio Cabbidu, now best known for his work at Montblanc-Minerva, as well as Michel Navas and Enrico Barbasini, the duo behind complications specialist La Fabrique du Temps. 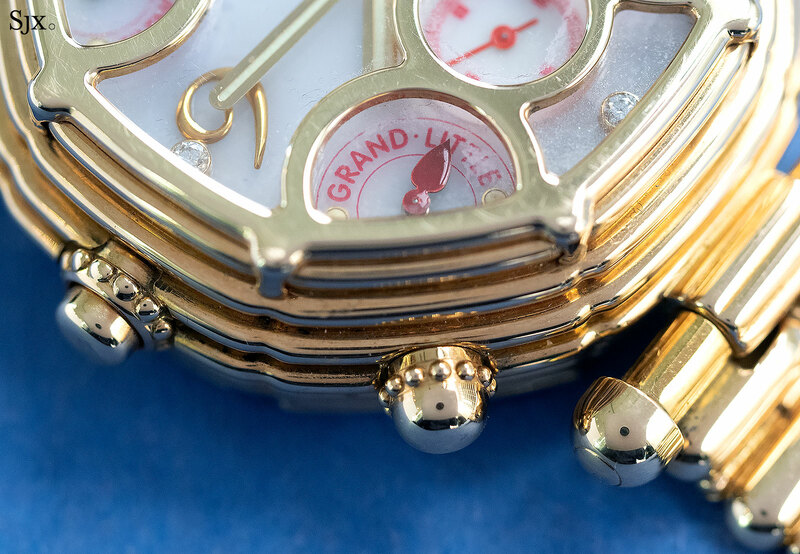 Perhaps two dozen Grande Sonnerie watches were made in the 1990s, all unique in material and dial design. Most were characterised by a stacked, pyramidal case that was either the brand’s trademark octagon or round. All of them are peculiar yet joyfully 1990s in style; beautiful they are not but impressive they are. Phillips’ upcoming Geneva watch auction includes one example of the Grande Sonnerie, specifically the ref. G0027.7. As was the case with all the Grande Sonnerie watches, the execution of this watch, in materials and finish, is a no expense spared affair. 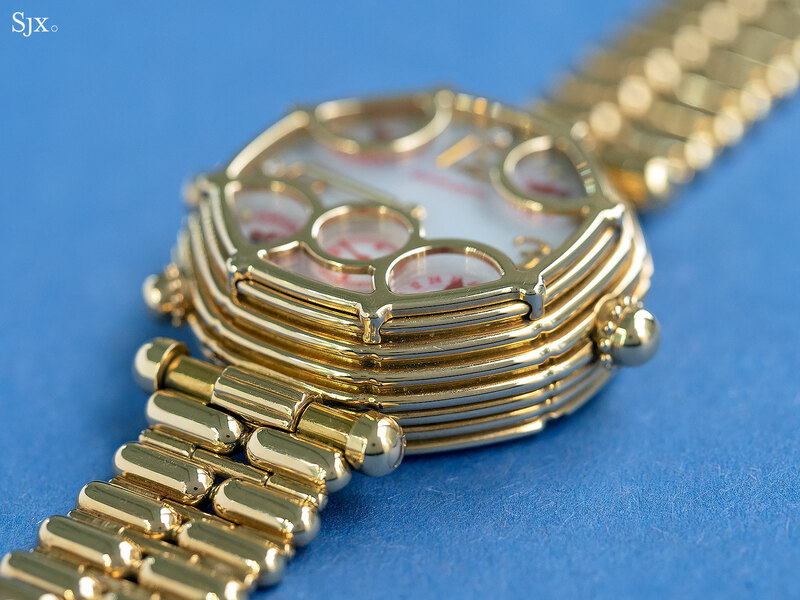 The case is compact, just 39mm in diameter, octagonal, pink gold, and fitted to a matching bracelet. The dial is pink mother of pearl featuring applied, solid gold Breguet numerals at the quarters paired with brilliant-cut diamonds. Being the base model Grande Sonnerie, this has four sub-dials – framed by a gold grille over the crystal – indicating silent or striking mode, striking power reserve, timekeeping power reserve, and grand or small strike mode. Turn the watch over and the cal. 31000 reveals itself. All the bridges are hand-engraved in relief with leaves and grapes, while the rotor is open-worked and also hand-engraved. 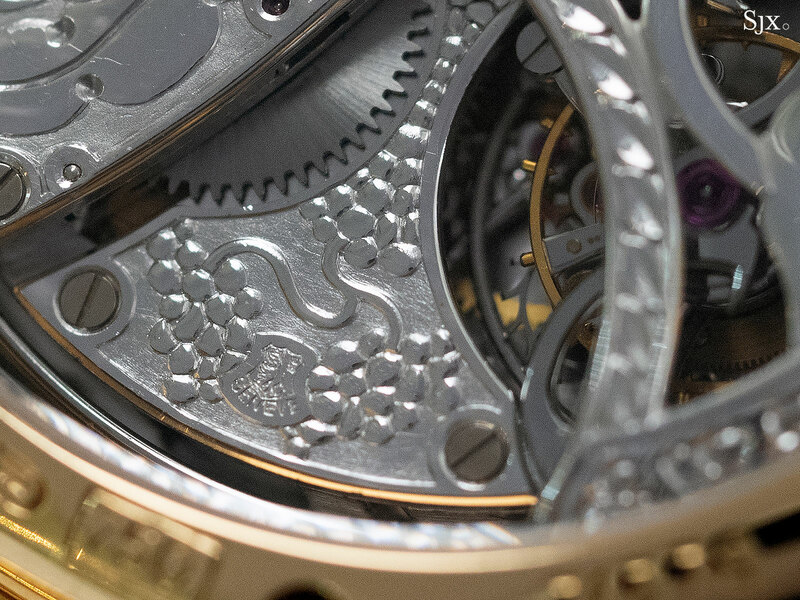 In fact, the tiny Poinçon de Genève hallmark, or Geneva Seal, is also hand-engraved. 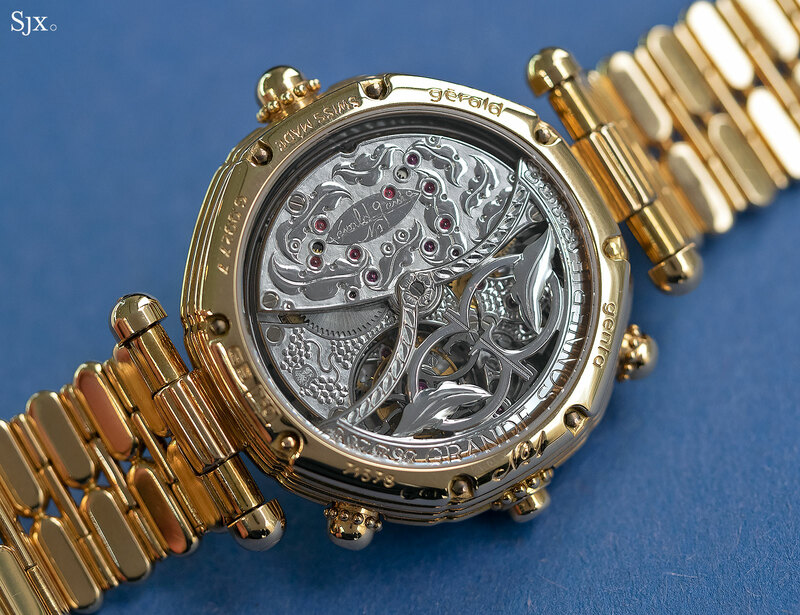 That was only possible because at its peak Gerald Genta had two manufactures, one in Geneva and another in Le Brassus, while Genta the man spent a lot of his time in Monte Carlo designing watches. 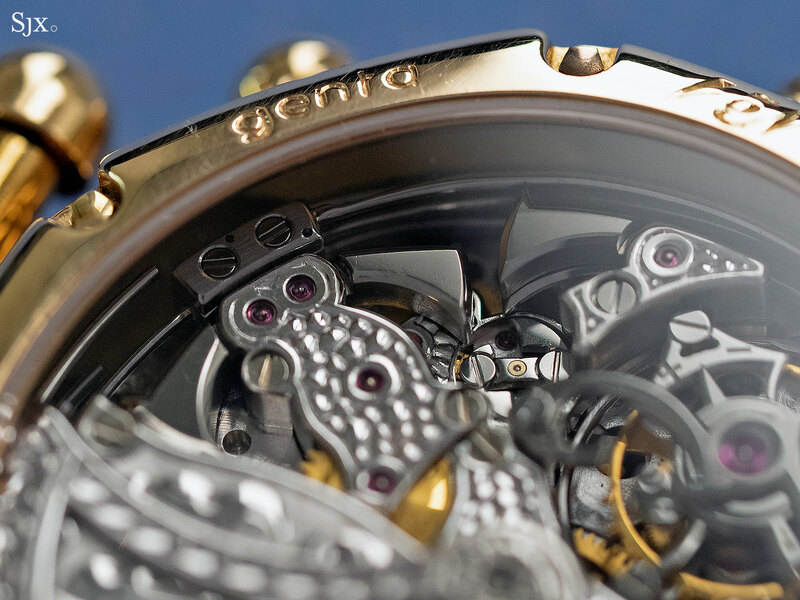 Genta regarded himself as a watch designer and artist, and the barrel bridge of the movement is engraved with his signature, as well as “No 1” (although all of the Grande Sonnerie watches were numbered “1” as all were one-off). 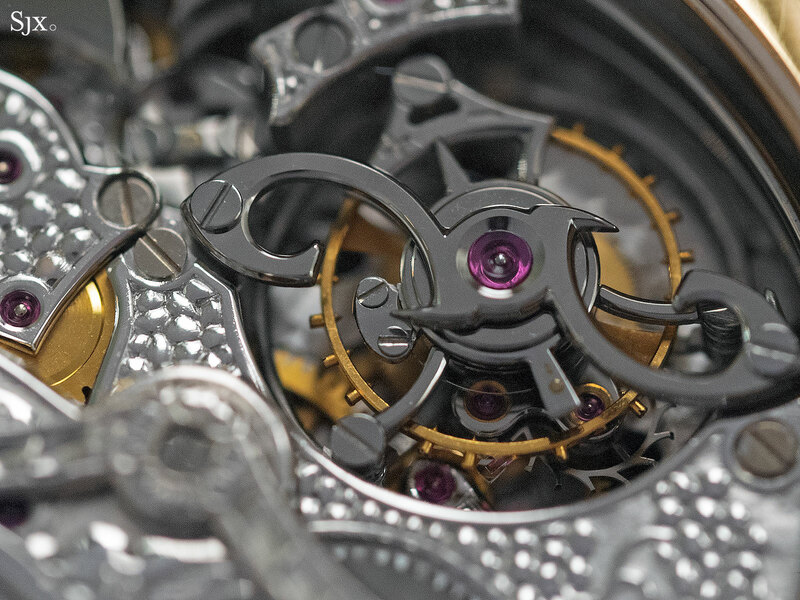 The tourbillon is held in place by a steel bridge shaped like a double “G” that is exquisitely finished. It’s entirely black polished, with bevelled edges that taper down to sharp points on the ends of each “G”. 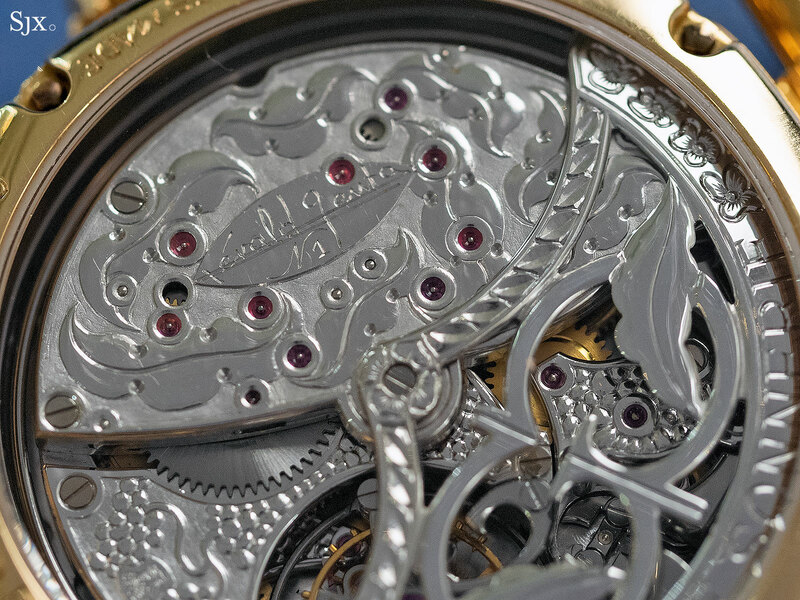 The tourbillon cage is similar finished, as are the four gongs of the grande sonnerie. There enough horological goodness, both technical and decorative, in this watch to please the most demanding of watch nerds. While the design might be hard to digest, it is quite nostalgic for someone who misses the watch world of 1990s. The watch shows some light wear, including some stray marks on the movement, but is preserved in good condition. Unfortunately, it isn’t accompanied by boxes or papers. This exact same watch was sold at Christie’s in 2008 for 99,000 Swiss francs. The estimate today is 60,000-120,000 Swiss francs. 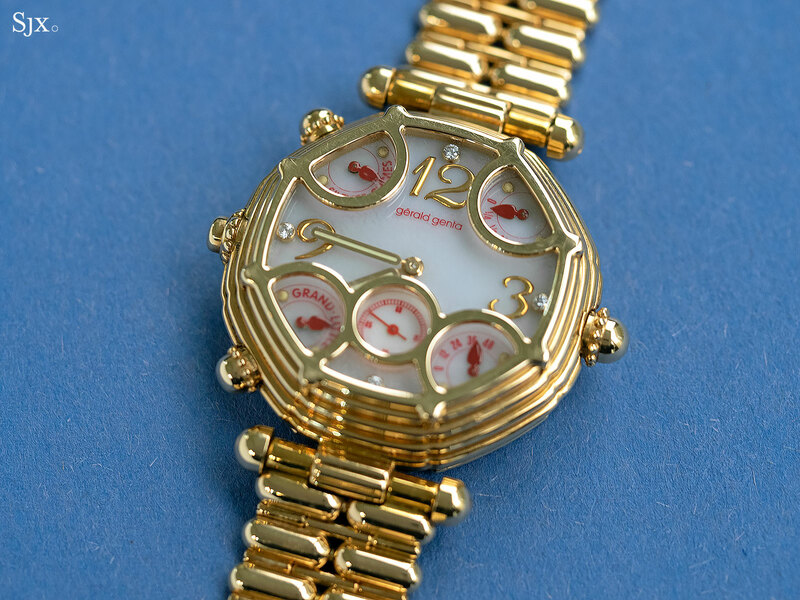 It’s lot 35 in The Geneva Watch Auction: Nine that takes place on May 11, 2019. You’ll find the full lot description here.